As you know, we’ve gotten around quite a bit. I am on my 8th home since graduating from college, and our sons are now on their 5th home. Each move brings new discoveries. With each new community we learn about our local schools, local churches, local grocery stores (I miss you, Publix! ), and local health care capabilities. One of those things we explore at each location is our local library. As many of us know, local library systems vary by community. They vary widely. It’s a function of readership and (most importantly) funding. When I was growing up, my mother made a point to take my sister and me to our local library branch up the street 1–2 times per month to keep our book stocks updated. Before the days of Amazon and Barnes & Noble online, making trips to a physical bookstore wasn’t as easy as simply heading to the nearby library. As I went out into the “real world,” I tried to continue that trend, even though with full time work my pleasure reading dwindled down to only 1–2 books per month, instead of the 5–6 books per month I devoured before age 21. Unfortunately, not every community had robust enough library services for my lifestyle. Once I had kids, the things I desired out of my local library changed as well. I was able to expose my sons to a nice library in Apex, North Carolina. As part of the Wake County library system, the Eva Perry Library had an amazing children’s section. To this day, my oldest son remembers the “tree room” where we attended preschool story time when we could*. There was an artificial tree poking up through the center of the room, with cushioned seating encircling the tree. My sons really enjoyed it. *When we were living in the community from 2005–2008, you had to get to story time very early to experience it. It appears that story time is now daily. Thank you! Once we moved to Nebraska, my oldest son started school and was blessed with a robust elementary school library system. He was always bringing home school library books. My youngest son and I would visit the Bellevue Public Library that was run by the city. Like Apex, it had a robust children’s section, but we rarely made it to storytime. That library was farther away so we had to incorporate time for driving to and from the location. The next community my sons lived in was Navarre, Florida, from 2010–2013. Once again, the library services were controlled by the county, with funding focuses tending towards the more-used libraries. The town of Navarre is very spread out and there was one small branch that wasn’t super-easy to access from our neighborhood. The hours were poor (no evening hours) and I had a hard time getting information about the relatively-new digital download capabilities that libraries were starting to receive. The library employees didn’t understand the system and couldn’t help me figure it out. The children’s section at this branch library was very small, and it wasn’t as welcoming a space as my sons had experienced in North Carolina or Nebraska. However, our Air Force base had a library. As do all Air Force bases. And the one at Hurlburt Field, Florida, is probably the best one I’d ever seen on a military installation. The head librarian was always seeking the newest technologies and solicited for volunteers who would be willing to learn about and share those technologies with inquiring customers. I had used the library as a student for a class I had attended at the base in 2008; they catered to the military students just as much as they did to the civilian community. Just before we moved there, the library had received a grant to start a children’s garden space and we saw the garden come to life in the 2 1/2 years we were living there. Considering one can garden year-round on the Florida panhandle, it didn’t take long for this project to blossom into something amazing. This is the library that taught me all about the Overdrive system, as well as borrowing magazines via the Zinio app. 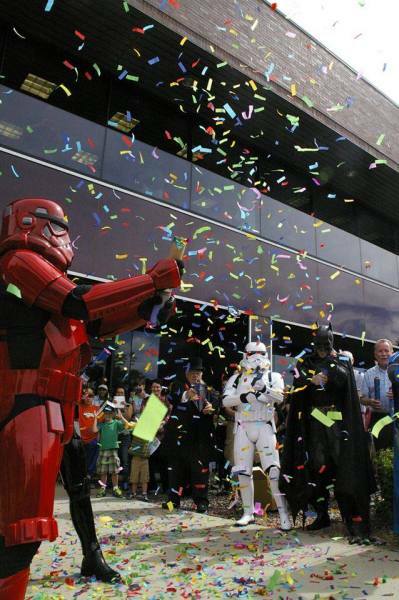 Members of the 501st Legion (and Batman too) helped with the grand opening of the Pikes Peak Library District Branch 21C in summer 2014. Image credit: Pikes Peak Library District. Facebook.com/Library21C. My the time my family moved to Colorado Springs in 2013, the wind was out of our sails about using the library. It was a combination of the boys’ school libraries, having digital devices at the ready, and just being too busy to read many pleasure books. In fact, we didn’t even set foot in our local branch here until fall of 2015: for the Colorado Springs Mini Maker Faire. The nearest branch of our library is relatively new, and it’s called Library 21c, where the “21c” stands for 21st Century. Library 21c is designed to be at the cutting edge of library and maker technologies. With two makerspaces and numerous computer labs on site, when the library opened in Spring 2014, it was the first of its kind in the country. This is also a place where community groups can meet off-site (such as our Boy Scout troop for merit badge classes), and take classes in maker and tech. The fact that it’s a repurposed office building that was obtained for cheap by the city of Colorado Springs adds to its charm. It’s a truly inspirational place. Recently, my 13-year-old son’s Boy Scout troop hosted a merit badge class at the library. I took him there, and we were seated at a table not far from the on-site cafe. We were also near the teen center. After the class, I encouraged my son to check out the teen center. The attendant sitting in the teen center was a young college-aged woman, and she answered my son’s questions about getting a library card, and even walked him through the procedures on getting an Overdrive account to check out digital books. She also demonstrated how to put books on hold and request inter-library loans. She was patient, friendly, and young enough to easily relate to things my son might be interested in. She was familiar with every book series he had read recently, and even provided numerous recommendations for future books he might like. Compared to experiences we had at other community libraries, where the volunteers were older and weren’t as comfortable with the technologies, my son’s experience was like a breath of fresh air. The teen center was a neat place. Parents/adults aren’t allowed to simply “hang out” in the area, although I was there briefly to co-sign for the library card. The area is meant for teens to meet, hang out, and be comfortable in a safe setting. There was a wall of desktop computers for use, and the books and magazines in the area were among the most popular in YA. This is a fresh start for our family after years of lackluster library experiences. I will likely continue to rely on online browsing, putting books on hold online, and limiting my library time to walking in to check out physical copies of books (or not walking in at all, but instead relying on Overdrive eBook downloads), but I am so happy with the resources available to my friends and neighbors here. Libraries are critical to a robust community. With the ease of online shopping and Amazon’s dominance in that realm, it’s become easier than ever to instantly download a digital book with that tempting “Buy now with 1-Click” button. I’ve fallen victim to its ease numerous times. Perhaps it’s easier to order a physical book and have it on your front porch in hours or just a couple days; for many that’s more convenient than taking oneself to the library. Save a few dollars and take advantage of your library. After all, you’re paying for it through your taxes. I know about $100 of my annual property tax bill goes towards my local library district. Be active in making sure your own local facilities are well-funded, and if you are interested in some of the newer programs available to libraries, ask your local staff whether it can be pursued. Check out your local library to see what’s available where you live.